Two years ago, Denis Brisebois decided to come back to help his parents on their family farm in Saskatchewan after spending the past 20 years in the oil industry. Since that time the family has invested in growing their land base from farming 11 quarters (600 acres with 120 cattle) to 21 quarters (1300 acres with 170 cattle). Denis was interested in transitioning to organic production and had the support of a certified organic neighbour who explained some of the required paperwork. Denis than made an appointment with a certifying body to get extra help with the paper work and submitted his application in May. Since his family farmed with no chemical or fertilizer, “we only needed one year in transition” Denis explained. Denis credits having organic neighbors that he could ask for help, a history of farming without sprays and synthetic fertilizers, and assistance with required paperwork as the three factors that contributed most to his easy transition to organics. The initial investment of time – Denis estimates fifteen hours of paperwork plus the initial cost to certify – now seems like a small commitment. Rather, one of the biggest challenges he faced was criticism from others who didn’t agree with organic farming. In 2015 (the year after transition), the Brisebois’ put in 830 acres and purchased 10 additional quarters of land. 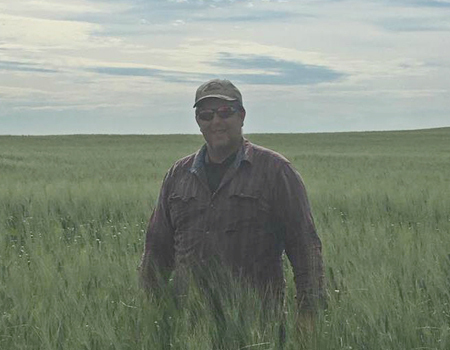 “The Kamut came up beautifully and then the July rain brought up the kochia weeds,” says Denis, “which resulted in over 50% dockage.” After crunching the numbers, Denis calculated that they had come out even with a clean crop (durum) that would have been sold on the open market. “The inspector came back later in the year to follow up. That instilled confidence the industry has its check and balances in place. The legitimacy to the word organic is not a gimmick,” explained Denis. What piece of advice you would give? Rather than transition all at once, Denis suggests doing it over a number of years, and to make sure you get out to meet organic farmers, grain buyers and service providers.